Lidget Compton Apex15 terracotta coloured tile effect concrete garage. Also see our Apex 20 granular steel tile effect is a choice of seven different colours. The Apex15 formally known as the Lidget Windsor is a building unique to the Lidget Compton range of concrete garages. The bold roll terracotta tile effect roofing is achieved with individual fibre-cement pantiles placed onto a much more substantial and steeper roof structure incorporating steel box section and much more timber supports. This building looks great with PVC fascias and brick front pillars are added and the optional steel access door now provides peace of mind with extra locking points supplied as standard. 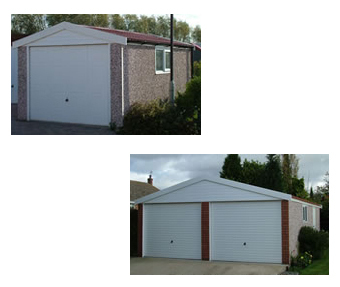 Like all Lidget buildings the structure is based upon predominately 2ft(W) concrete garage panels to which spar (pebbledash) is added, brick, stone or hand finished and seamless textured finishes. The panels are 6ft6in high, but extra-high 7ft6in may also be specified. Complete warranty providing total peace of mind. Apex15 - Why Buy Lidget Compton?